Earlier this month I had the privilege to speak at a women’s conference for ten like-minded Fort Worth churches. I spoke on family worship in the home–developing daily habits, or liturgies (which can be defined as habitual group actions), reflective of the gospel and of the church’s worship in order to cultivate Christlikeness in our children. I think of our homeschool day in two categories. There’s our skill work, which is important because you really should know it for life (and to get into college), because it disciplines the mind, and because it reflects God’s order and absolute nature. These are subjects like math, Latin, English grammar, spelling, and the mechanics of writing, and these things have to be taught incrementally because they rely on prior knowledge. Then there’s what I think of as our idea work. This is where we cultivate our imaginations and our affections and where we grow to be more fully human. I tend to place more emphasis on these things (over our skill work) because if my kids can’t do an algebraic equation when they’re grown or decline a Latin noun, I’ll think, hmm, maybe I failed them in that area–but I won’t think I failed them as human beings. (These things are important, and The Liberal Arts Tradition provides some of the best reasons I’ve heard to keep at the skill subjects with excellence, but that’s for another post.) However, if they have bad habits or lack character discernment or can’t recognize true beauty or aren’t fully grounded in God’s Word, that’s when I’ll think I’ve failed them as human beings! And it’s these virtues that the idea work speaks to–things like Scripture reading and memory, great literature, history, poetry memorization, etc. These things form our idea of what it means to be a person created in God’s image to live to His glory. I think you can see how this reflects, at least in some way, the elements of worship in most traditions. (Bryan Chapell’s Christ-Centered Worship: Letting the Gospel Shape Our Practice presents a fascinating discussion of the history and somewhat surprising unity of worship practices across church traditions since the time of the early church until the modern age.) Importantly, it also closely reflects our church’s Sunday worship service. I’ll tell you what, doing morning time like this has been so great! At the women’s conference, I said that what we do in our homes six days a week will be much more fruitful in the long run than what happens once a week on Sundays. How we worship corporately six days a week in our homes will also make corporate worship on Sundays with our fellow believers that much more meaningful. In just the short time since we’ve implemented our liturgical morning time, I’ve already seen the fruit of this on Sunday. Excellent, thank you for sharing your morning time outline! I am inspired to add to ours. Thanks for your comment, Amy! 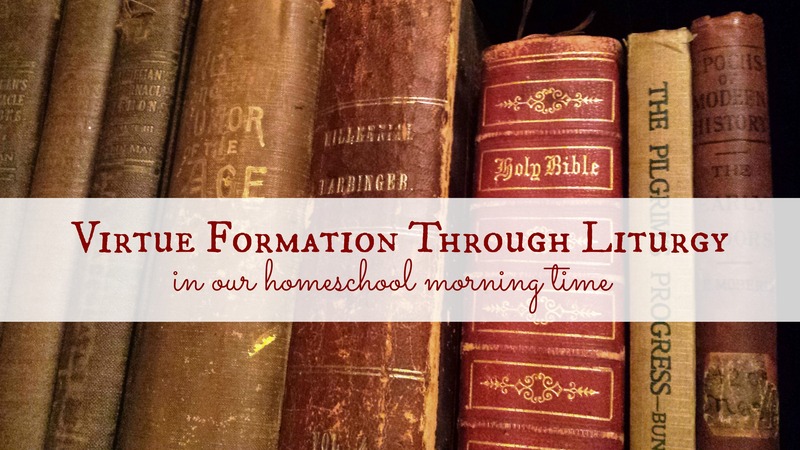 Doing morning time like this is proving to be such a blessing in our homeschool days.